There's a lot of moneymaking potential in email marketing. Research shows that for every $1 spent, businesses typically see a $40 return on investment. 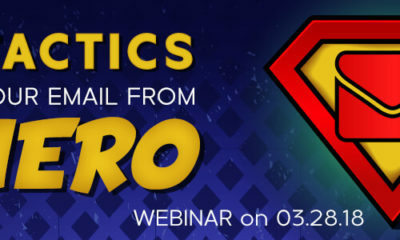 In fact, email campaigns offer the highest return on investment compared to other marketing options, like catalogs, banner ads and SEO tactics, according to the Direct Marketing Association. But, coming up with new and creative emails to send your subscribers can be tough. Sometimes the idea well runs dry. So, to help businesses find some inspiration for fresh and fun emails, here's a look at four campaigns that you should mimic. Looking for a unique way to engage customers and provide valuable information? A growing number of brands are offering mini classes or lessons via email. For instance, a kitchenware company could offer a weekly email that contains recipes for dinner each night of the week, or an online photo editing service could offer a mini editing class. Every day for a week customers are introduced to a new editing tool. The class could come with access to a premium package of services too, to introduce potential customers to bigger, better options. Send your subscribers an invitation to your new class, and if they register for it, you can create a new segment that's specifically for this purpose. The invitation should explain what the class is, what customers get out of it and how many emails the class will consist of. Online publisher BuzzFeed offered a 4-week workout course to a subset of its subscribers that are interested in their weekly "Life" publication. Those that signed up were sent a weekly email that detailed specific exercises for the week. The course was broken up by workout routines. For instance, the first week focused on the core. The key to emailing these classes is to offer lessons that are connected to your business, and that customers are interested in. Then, you'll have to take some time to figure out how to break the class into digestible pieces. You should also consider a consistent look and theme. BuzzFeed made sure each email was presented with this purple background, and included moving images of people completing the exercise. Compare the email from week one above, to the email from week two below. It's a consistent look and theme. 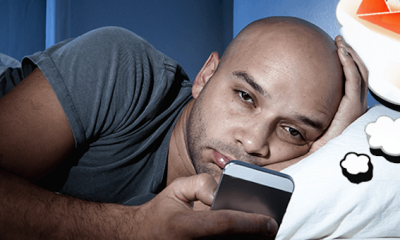 Every business sends promotional emails to encourage customers to make a purchase. Promotional emails, especially those with discounts, are effective. Research shows emails with discounts influence a purchase decision more than direct mail, text message and Facebook posts, according to research from BlueHornet. Promotional emails are great, but you have to do more than send a coupon. The first promotional email gets customers interested, but it might not land a sale. That's why sending a reminder email is so important. Your customers are busy, so reminding them about a great deal is helpful. 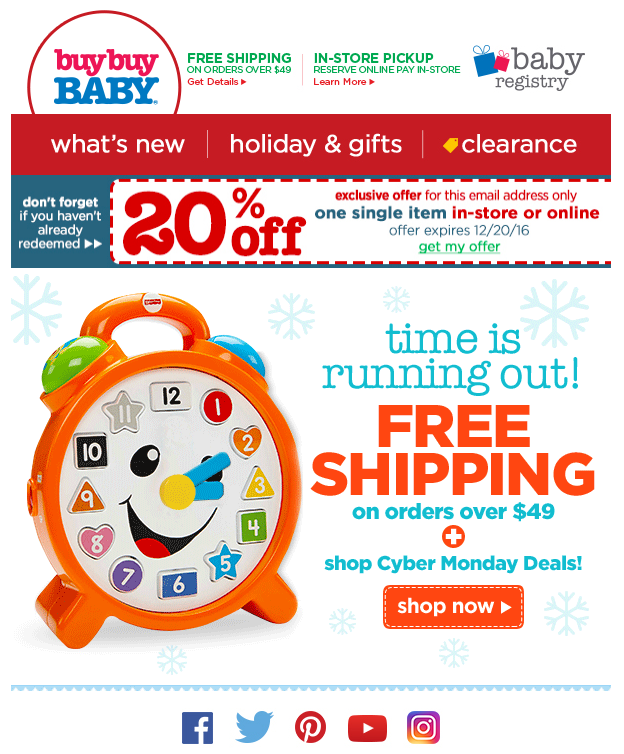 A baby retailer emailed this deal for CyberMonday, and then followed it up a few hours later with the reminder email below it. If customers started shopping through your online store and put items in a cart, but didn't checkout, you can send a cart abandonment email. It's another example of a reminder email that encourages customers to revisit your site and actually pay for the items that they took the time to select. Cart abandonment rates range from 70-80 percent, but research suggests that a reminder email can result in at least a 20 percent conversion rate. Pinpointe users can automate this process, so when a cart is abandoned it triggers a reminder email to land in the customer's inbox. How often do you give gifts throughout the year? Christmas and birthdays are probably the two biggest and most traditional gift-giving holidays, but there are about a dozen other times a year you'll likely need a gift. From weddings and baptisms to Father's Day and Easter, there's always a need for a well-thought-out present. But, let's be honest, coming up with that well-thought-out gift is tough. Enter gift guides. Businesses can create gift guides for various occasions and email them to customers. Gift guides give customers inspiration, which is invaluable when you're stumped about what to get your husband for Father's Day, or your teenage son for his birthday. You can create a gift guide in a few different ways. One of the most popular is to send a guide that shows a handful of gifts. This kind of email gives customers the chance to browse several products without leaving the email, and gives specific call to action buttons for each one. Here's an example that showcases gifts, and also highlights the low prices too. You can also send an email that connects customers to a variety of gift guides on your website. 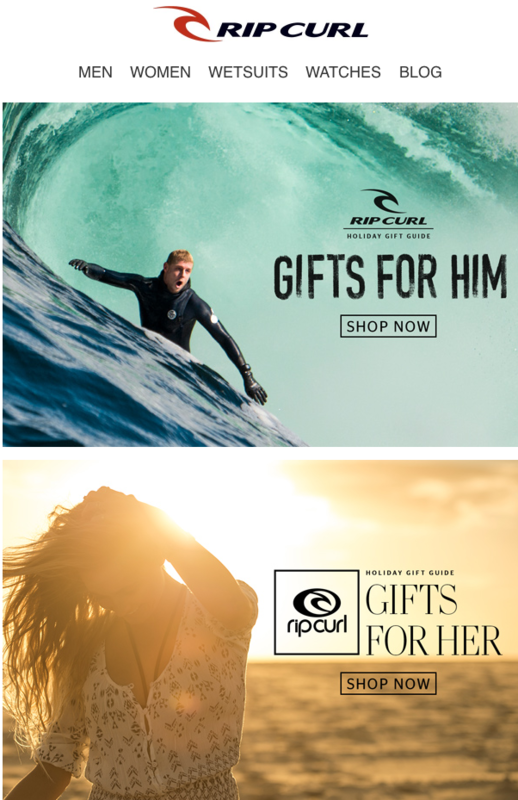 For example, Rip Curl sent this email to its customers that encourages them to check out two different guides, one that focuses on "Gifts for Her" and one that focuses on "Gifts for Him." When customers click on a guide they're taken to the Rip Curl website to shop for specific gifts and make purchases through the online store. Remember, you can send gift guides for a variety of occasions, not just holidays. Send a gift guide that offers deals on wedding gifts or graduation presents. Guides don't have to focus purely on gifts either. The guides can focus on party-prep. For instance, offer products or services that customers can use to get their home ready for a big gathering. Just break the gift guide up by a certain category, like Gifts for Him, Wedding Gifts Under $25 or Gifts for Golfers on Father's Day. You can also send a follow up email with a discount or a coupon for any gift featured on the guide. Everyone makes mistakes, and considering the number of steps taken to create and send an email, you'll probably make a mistake at some point in time. 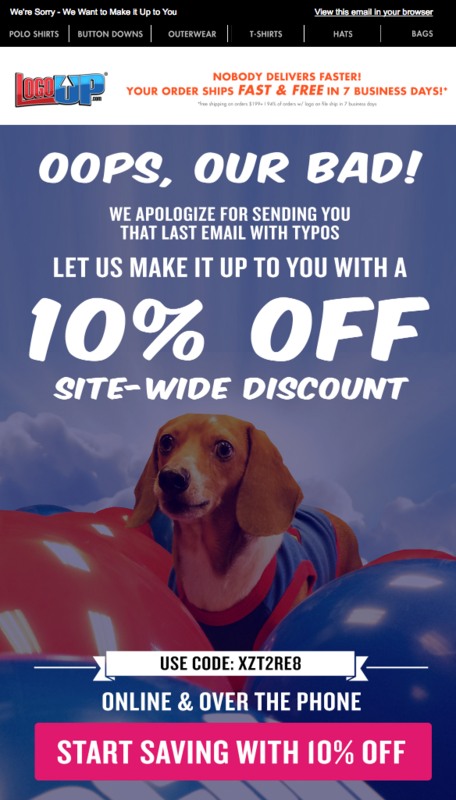 From typos to sending an email to the wrong segment, the list of possible mistakes is lengthy. If you make a mistake, you should send an apology immediately. You don't have to grovel, just include a line that acknowledges the mistake, and consider offering a discount or a deal to smooth everything over. 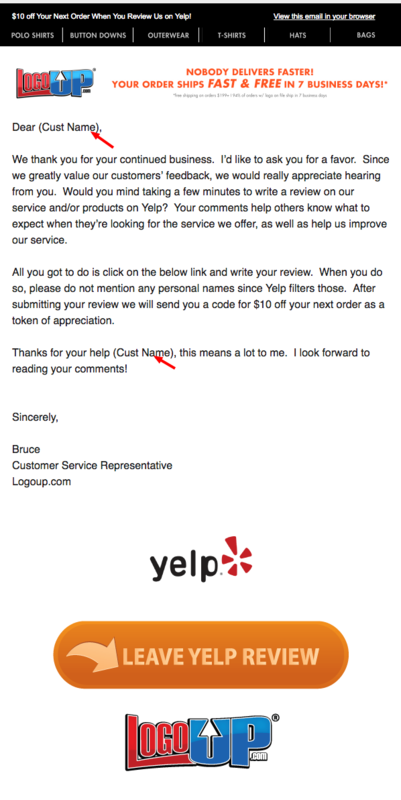 Here's an example of an email from LogoUp that has mistakes. The email says, Dear (Cust Name). Obviously, a customer's name was supposed to go in the parenthesis, but something went wrong. Within a few hours, the company realized the mistake and sent an apology. And, as suggested earlier, offers a discount too. Of course, avoiding this kind of mistake in the first place is ideal, but the company handled the mistake promptly and acknowledged fault. To avoid mistakes like this, make sure you preview your emails before sending them. 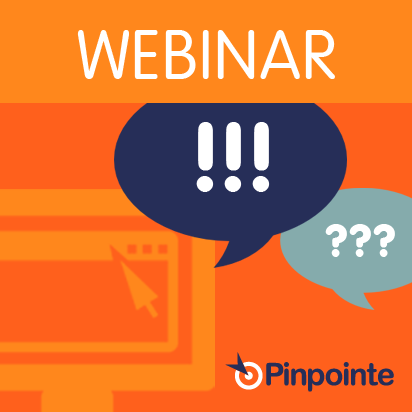 Pinpointe users have access to an email campaign previewer that not only checks the email's appearance, but also it's deliverability. You should also proof read your emails. Consider running the text through an online tool like Grammarly, which can check for common mistakes like misspelling or grammatical errors. 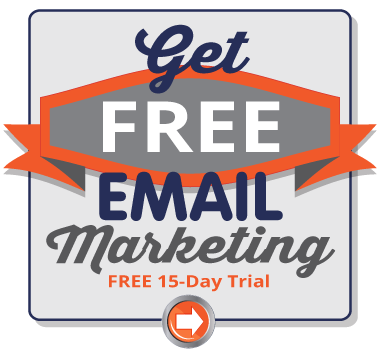 The goal of email marketing is to engage subscribers, increase brand awareness and drive sales. To meet these goals, you have to send emails that inspire customers and encourage them to act quickly. Consider using the four campaigns above as inspiration for your next email. And, remember, it's okay to try something new. You don't have to stick to the same kind of emails over and over again. Get a little creative and your customers will thank you for it by responding to your email.